Asbestos is highly toxic and was once used in a significant number of building materials. Homes built before 1980 in Washington, DC will most likely contain asbestos products. If you are planning a house renovation, it is recommended that you have the house inspected by a licensed asbestos inspector to avoid exposure to asbestos particles. An asbestos inspector in the Washington, DC area will collect samples from any material suspected of containing asbestos and have it tested. Materials that contain asbestos can look exactly like materials that do not contain asbestos. Testing by a trained laboratory analyst using a microscope is the only way to tell the difference. Textured paint and patching compounds used on walls and ceiling joints. Fireplaces may have asbestos boards hidden in the back of fireplaces or below the mantels. Artificial embers and ashes used in gas fireplaces. Asbestos insulation wrapped around ducts and piping, and asbestos tape used for seams of metal ducting. Furnace room walls may be covered with asbestos cement board, also known as Transite. Some vinyl flooring tiles and the backing on vinyl sheet flooring and adhesives. Asbestos materials used to coat hot water and steam pipes in older homes or covered with an asbestos blanket or tape. Asbestos insulation used for oil and coal furnaces and door gaskets. Asbestos compounds in older products such as stove-top pads. Some roofing materials such as asphalt roofing shingles and asphalt roofing paper. Some hollow concrete block walls may have been filled with Vermiculite insulation that is found in attics. Loose insulation is known to contain asbestos fibers, especially Vermiculite attic insulation. Putty used on older windows and asbestos cement siding materials used on the outside of older homes. 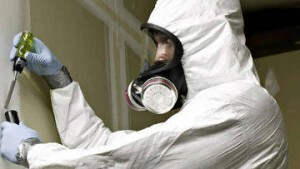 Whenever asbestos inspectors find materials containing asbestos, an asbestos abatement will need to be done. Never try to remove the asbestos materials yourself. Asbestos needs to be removed or repaired by professionals who are trained in asbestos removal and who wear special protective clothing and respirators. Protect yourself and anyone else who is working in or around your house in Washington, DC during the renovation.